Martial arts are supposed to be painful, right? I’m not talking about pushing through the pain or fatigue of a good workout, nor the therapeutic pain of a deep tissue massage. I’m referring to pain compliance, causing another person pain as an effective tool for getting the desired result. 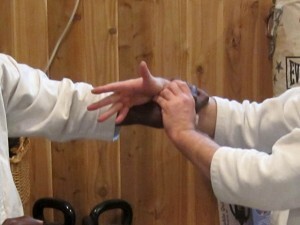 In grappling based arts like Hakkoryu, it usually takes the shape of small joint locks and the use of pressure points. This kind of pain can be alluring, intoxicating, and even fun in its own way. Receiving it gets our endorphins firing and intensifies our experience of living. People say that it “builds character” and it can make us feel more alive. When we cause pain to others, it usually elicits a reaction. The other person may give up their posture and/or get distracted for a moment. Or maybe they fall down and disengage. Some students (and masters) use pain as a metric for whether their technique is working or not. I’m very familiar with pain as motivating factor. My teacher was very good at causing specific and precise experiences of pain on the mats. 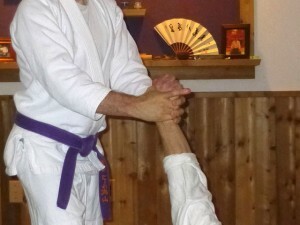 Whether it was from positioning a joint lock a certain way, atemi (striking or pressure points), or just the threat of pain, I was introduced to experiences of pain way beyond what I had known outside the dojo. He was really good at it, better than most I’d say. Yet, as he continued to grow as a person and progress in the art, he began to see that an over-reliance on creating pain could be a trap in itself. More specifically, it prevented his developing other skills and qualities in the art that he felt were equally or more important. As an aside, I think this was one of the things that impressed me the most about him. He was rarely content to rest upon his laurels, and never stopped searching and asking questions. Some might argue that we’re studying an art known for being very painful, and point to its incorporation of meridian theory, shiatsu, and pressure points. Ok, sure. But is causing pain really what this art is about? Moreover, is pain compliance really as effective as some seem to think that it is? As students we are often told to or just learn to sit there, take take the pain, and then to come back and grab the person again in the same way. Maybe we’re told that’s the way that the techniques are supposed to be done. Or that without it the techniques won’t work. But I find that many of these demos or training situations aren’t very realistic. Fights or violent encounters usually don’t go down this way. People move and they don’t just give you their limbs and stand there waiting for you to apply a technique on them within a limited set of options. They are usually evading or launching another attack. They can quickly shut down a joint lock or rip their hand away from yours (if given the permission to do so). But that doesn’t often happen on the mats. Rather when one’s technique is questioned or challenged, the answer in these cases is usually to put it on harder or faster, change the technique or maybe just hit the other person. Ok, fine, but is that what Hakkoryu or better yet, is that good jujutsu? Are we really fighting? I also find it really interesting how when we set up to create a specific pain response we often introduce tension in ourselves which can be used against us. We become the attacker and our intent to harm is a liability which can be exploited. This is why a lot of weapons based arts will tell you not to grab the other person or try to catch the weapon. We become fixed in space and an easy target for getting cut or stabbed. We’ve also heard of stories and reports of people with a high tolerance to pain. Whether it’s someone loaded on alcohol or someone so hopped up with adrenaline that they don’t feel their nose being broken. Some people are just wired that way. I’ve trained with people who will just stand there looking at you while cranking on their wrist or applying an atemi (pressure point) that would have the average person screaming. I think this is a pretty good working definition. Pain is essentially our body, our nervous system sending information to our brain telling us that something is happening. For us, its often that the joint has arrived close to its natural range of movement and that we need to do something about it. This information sets off an ‘alarm’ in us which says “stop this thing from happening” and creates more resistance. We know what is happening and will probably try to do everything we can to stop it (off the mats and outside the student/teacher experience of course). If the effectiveness of our technique relies on using pain to move someone, we’ll probably have a fight on our hands. Pain compliance does work…that is, until it doesn’t. It can be a valuable tool to have in one’s martial toolbox and personally I think everyone working to become a well-rounded jujutsu practitioner should be somewhat proficient in how to create and how to receive pain. Pain is a part of the experience of having (or being) a physical body. Yet, there is another problem with an over-reliance on pain compliance. A fixation on making our techniques painful can obscure what is actually going on and prevent us from exploring and practicing techniques in other ways. 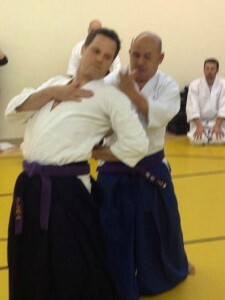 When the aite (other person) or uke (commonly described as the attacker) moves in such a way as to avoid pain or getting injured their reaction provides feedback to our nervous systems that the technique is working. It may elicit a response which may seem to be a lot like the one we’re looking for. So we may think that we got the job done, and our technique is good enough. If so, we’re satisfied and our approach is reinforced. But was that what we actually set out to do? Or are we just sweeping our lack of technique under the rug so to speak? And are we working from the assumption that these techniques are just a bunch of different ways to hurt people? Is that really what this art is about? Which leads me to the second point. I’ve personally found that many of the shapes required to cause the most pain in a technique interfere or prevent me from practicing the lessons in the higher levels of the art. For those of us who have been exposed to the advanced teachings, are we practicing and getting better at those things? To this end, a while back I began doing techniques causing as little pain as possible. Not only because I don’t want to injure my training partners, but because it makes it more difficult for me and I want to know that I’m actually moving the person with good mechanics and body usage. Years ago, another one of my teachers told me that there are different types of pain in Hakkoryu. He said there is “ugly pain” and there is “delicious or sweet pain” and that we must distinguish between them in our practice. I might rephrase this and call it “healing pain” or “destructive pain”, but I think everyone probably knows what I’m talking about. There’s the pain of a good stretch and there’s the pain of someone knowingly or unknowingly injuring your soft tissue and ligaments. A well-applied technique can often result in stretching tight tissues in a joint or other area of the body. The body will start sending signals to the brain saying “hey, something is happening here. I better go with this or it could get bad”. This is to be expected as a natural response to a part of the body being loaded with weight or force running through it. The intention or mindset behind it is different. The body is sending pain signals because its tight or carrying more load than usual, not because the person is trying to injure us. If done slowly and/or with awareness and sensitivity on the part of the person applying the technique, it can actually feel pretty good. Its the same in our shiatsu practice. Getting your kankei (liver meridian) worked doesn’t always feel good or relaxing. 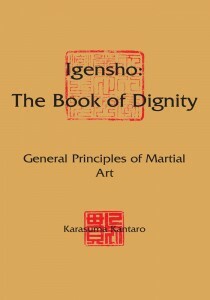 But if the shiatsu practitioners intent is good, then we open up to it in response. However, if we use too much force or stimulation, instead of actually helping our friend, family member, or patient we risk creating more resistance. They are unable to relax and receive the work in a deeper way and tense up more. We may think we’re helping them or doing them good, but they are actually more anxious and defensive as a result. Its also common for otherwise well intentioned people to assume that we know what someone needs without actually being aware and sensitive to what is actually going on. If we come in to “do some shiatsu” and just run through our shiatsu program like a robot, we’ll probably end up missing a lot. Instead we need the presence of mind in the moment to see what is going on and what is actually needed by the other person. Should our jujutsu practice be that different? When someone comes at me in a forceful or violent manner and I respond with an automatic response and/or an intent to injure, is this the highest embodiment of our art? If my response perpetuates and escalates the level of violence and aggression, and continues the pattern (physically, psychologically, or legally) have I really “won”? Don’t get me wrong, I’m all for keeping things “realistic” and I do think that a greater awareness of pain should be a part of our martial study. Rather, I’m suggesting that fixating on pain as being the thing that makes a technique work – or relying on pain to get the job done when the technique isn’t working can often shortchange our practice and the art we’re studying. We may find that the art is about more than that, and find that sometimes it is more effective to move or put the other person in a position where they cannot hurt us. Sometimes pain may play a role in this, but often it just gets in the way.